It was a nightmare to me when I was small - going to a doctor, exposing my your arm and get it jabbed by a needle. I hated it. But getting vaccinated saved me a lot of pain as I never ended up having measles. Vaccination is a controversial topic among different communities. Some say they are promoted by pharmaceutical companies for money making purposes only and are not healthy for any human being, let alone small children. 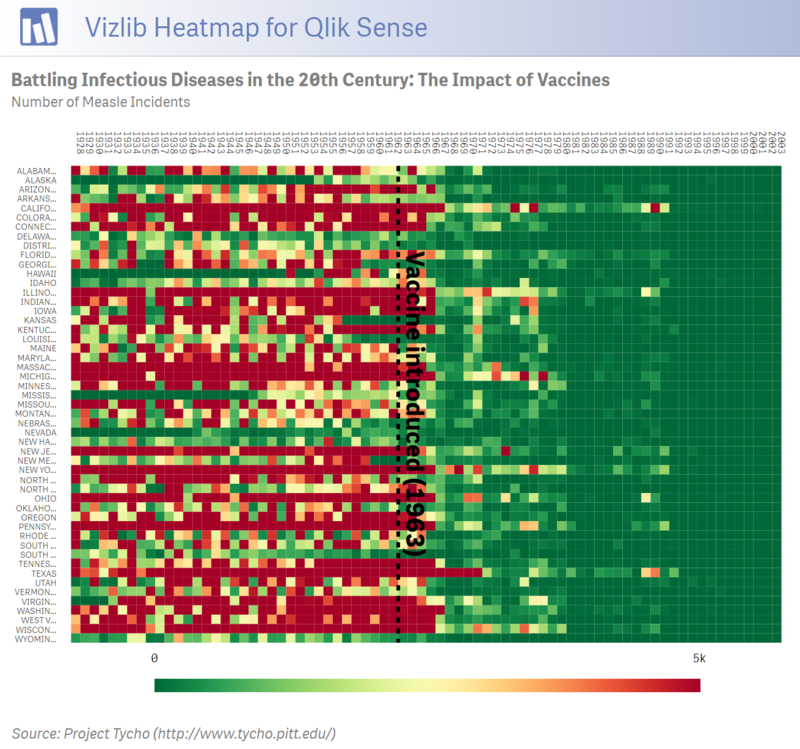 As with every debate or arguments, decisions should be data-driven and not based on opinion, and this is where our newly released Vizlib Heatmap extension for Qlik Sense can help like in the case of Measles incidents, taken from Project Tycho (https://www.tycho.pitt.edu/) of University of Pittsburgh. Measles (Wikipedia Link) is a highly infectious skin disease, which comes with high fever, caused by a contagious virus. 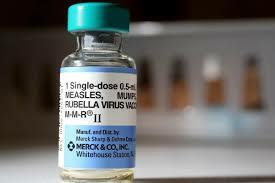 Once a person had measles, he develops an immunity against the virus. In the below example, we are analysing the number of measles cases in each US state in the last 100 years. The column values represent the Years and the Rows the US States. The colours represent the number of recorded Measle Incidents, with >5,000 incidents in red and 0 in green, creating a graphical heatmap representation of our data. There have been a lot of incidents, highlighted in red, at the beginning of the century, but abruptly, the number of cases dropped: Why? 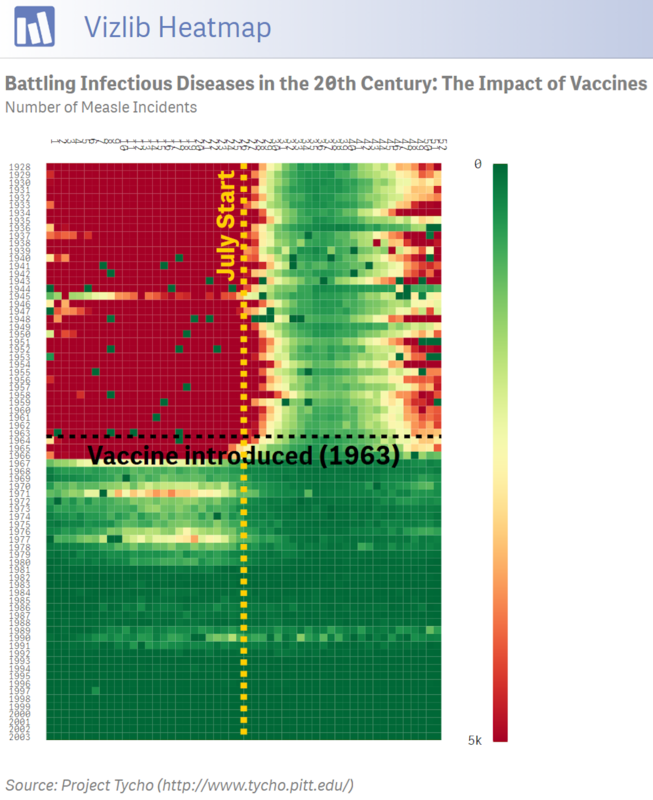 At the inflection point, a reference line helps you display a significant event which occurred in 1963: the introduction of the vaccine for measles. If you look at the data from a different angle, you can discover another interesting insight. The introduction of the vaccine in 1963 still beautifully visualizes its effect of decreasing incidents over the years, but there's another dominant period of low incidents even before 1963, especially between the weeks 28 and 44. This period actually represents the summer periods each year, letting us conclude that even before vaccination the incidents were significantly lower during the summer months. A warmer weather apparently has a combating effect on Measles. Some of you, however, may notice that weeks 28 to 44 present the months from the start of July until end of November. Surely November isn't summer anymore? Is it because symptoms take a couple of weeks to develop? Is there something else the data wants to tell us? Discover the story in your data using the Vizlib Heatmap.